Wow! Thanks to supporters like YOU, the Museum has been offering affordable opportunities for the young and young at heart to learn, connect and grow through interactive play for 20 years! You can support the past, present and future of hands-on learning and play with your tax-deductible gift to the Children's Museum of La Crosse. 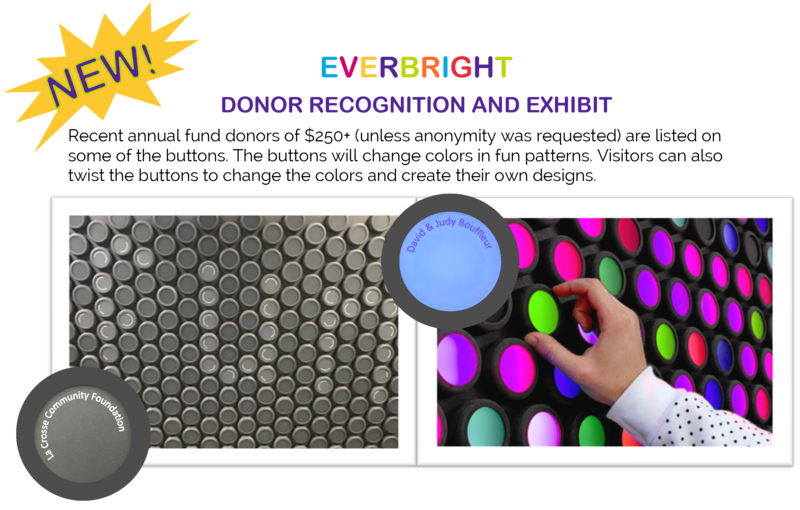 All donors of $250+ will be proudly recognized on a colorful, interactive exhibit (unless anonymity is indicated). As a 501(c)(3) non-profit organization with no Government or United Way funding, the Children's Museum relies on the generous support of people like you to allow us to continue to provide affordable and accessible opportunities for the young and the young at heart to learn, connect and grow through interactive play. Leave a Legacy of Learning and Laughter...Remember the Children's Museum of La Crosse in your bequest or other planned giving. Check if you would like more information.